We’d love your help. Let us know what’s wrong with this preview of Servant of a Dark God by John D. Brown. This is an obsolete edition. The author completely revised and updated the book. The new version is titled Servant and was released November, 2013. A spirited blacksmith's daughter accused of using the dark and terrifying sleth magic. Trapped in a web of lies and ancient secrets, of right bec This is an obsolete edition. The author completely revised and updated the book. The new version is titled Servant and was released November, 2013. To ask other readers questions about Servant of a Dark God, please sign up. Okay. Let's face it. You pick up a fantasy book these days and think two things: 1. I wonder how many decades it's gonna take for the series to actually be completed, and 2. how soon will they be on the road? Imagine my complete shock and delight to realize that THIS IS A STANDALONE NOVEL! Not part of a series! AND, AND, AND, at page 100 I literally said out loud, "Holy frak, I don't think they're going to go on a quest! They're actually going to stay home and solve their problems!" Groundbreaking Okay. Let's face it. You pick up a fantasy book these days and think two things: 1. I wonder how many decades it's gonna take for the series to actually be completed, and 2. how soon will they be on the road? Groundbreaking. Refreshing. Choirs of angels came down and I nearly wept. Don't get me wrong: I do love fantasy. Heck, you may notice that I have written a few paltry volumes of the stuff. But after a while you become jaded. After a while, you start thinking, I wonder if they'll be taking an elf, a dwarf, and four hobbits on their quest? and snickering cynically to yourself. I do not actually read much grown up high fantasy these days, for that very reason. But I know John Brown, and he's a great guy, so I bought his book and dipped one toe in, then another, so to speak. Read with one eye closed, if you will. Half-afraid that the next time I saw John, I would have to lie. BUT I DON'T HAVE TO LIE! I really, really, really just enjoyed the HELL out of this book! I loved the characters! I loved the conqueror/conquered prejudice that was bringing their community to the boiling point even before a monster made out of rocks and dead grass started eating people. (FYI, there's a monster made of rocks and dead grass, and he's fully awesome.) I loved the fact that Talen, who was our Callow Youth on this Hero's Journey, to use Campbell's parlance, could be extremely stubborn and even kind of a jerk, because hey, it made him more believable! The world was meticulous, the language and customs of the book were very well done, giving a real sense of a strange, exotic world, but without leaving me scratching my head wondering what was going on or what they were wearing. The action was well done, and so were the quieter moments. If I have to lodge one complaint, it's that this book was almost too stressful. I cared about the characters so much, and they went through so much awfulness, that I actually had to put the book down for a day or two and read something fluffy, because I just couldn't stand it for a little bit. But don't let that deter you! John is a great writer, and you will (I hope) enjoy this book as much as I did! Putting comparisons aside for a moment, lets look at Servant of a Dark God on its own. Frankly, it’s difficult for an author to start a book in a way that makes you fall in love with the world and the characters right away. And, honestly, some authors have a hard time making you appreciate the lead character at all. But this is not a problem for John Brown. As a matter of fact, I believe that this is one of his strengths. Can I stress how important good characters are to a story? I don’t care what anybody else says, if you don’t care for the character then you won’t care for the story. From the get go, John takes us into a world that is rich and well thought out, full of characters that are unique and lovable. But though the characters themselves are original and unique, the emotions and feelings they express are not. What they experience inside their minds and hearts is what most of us are able to feel at any given moment and its truthful. It speaks to the reader because it’s genuine. I’ve caught myself many times, in the process of reading this book, thinking “I can understand that,” or “I totally know what he’s thinking, that’s what I would think too.” That is talent, and it works to the advantage of the story itself. Now, this is not saying that every little aspect of the book is like this, there are some elements that are expected and even maybe a little too predictable, in my opinion. I think I might have expected some twists here and there that never came to pass. I was making myself hope for things that would have made the plot even more surprising, but they didn’t always come true. But what’s to say that what I found predictable wasn’t a surprise to others? I’ll finish with writing style. I found John’s writing and descriptions to be intricate and luring in the most simple of ways. No big words, no tirades and no lengthy descriptions. It’s straight to the point, subtly eloquent and visually engaging. Now, can Servant of a Dark God and the rest of the upcoming series give me what I had lost after finishing the Riftwar saga? Well, my opinion would be completely biased, say I’ll only say ‘We”ll see”. But the fact that it reminded me of Riftwar by the style, the character development and other factors is pretty substantial. Anybody who has read Raymond E. Feist will now that me even comparing anybody to him is making a bold statement. First of all let me say that I love the fact that serious and erudite fantasy is making the move back toward shorter series (and in some cases even stand-alone books). It doesn’t matter how good of a writer one is, carrying a series to 7, 8, 12, or more books is going to lead to duds, delays, alienated fans, and an uneven overall narrative. No one has done it well. Beyond that I enjoy reading an author’s idea for more than just one world and concept. Brown advised me on Twitter (he is @authorjohnbrown) that “Servant of a Dark God” is book one of a trilogy. I’m looking forward to the other two with great anticipation. In interest of full disclosure, Brown sent me a gratis copy of the book, but this is the same review I would have written even if he would not have. Perhaps my favorite thing about “Servant” is its pace. A lot happens during the course of a narrative, but it is over a relatively short amount of time and the writing lets the events unfold naturally. One is introduced to the protagonists in the form of an extended family and their friends. The impression that one gets while reading is that the land and its people would feel right at home in “A Little House on the Prairie.” It is simple folks that are introduced to the reader and one understands that their world is confined to a small crumb of the greater world outside. But that larger world is only hinted at and never shown. The given names in “Servant of a Dark God” are supremely organic and lend a touch of authenticity. Names like River, and Sugar, and Legs seem to frame a place uninfluenced by the real world but at the same time familiar and relateable. Talen is a teenager living life relatively drama-free on his Da’s farm. The region is under constant attack from the Bone Faces, a barbarian race of invaders, but those skirmishes have become a way of life for Talen and his family (Talen, his Da – Hogan, and brother Ke have all fought in the skirmishes) and days bleed out slowly in an otherwise comfortable manner. Talen is not immediately likeable in the sense of a traditional Hero’s Quest plot device. However, he is instantly recognizable being an awful lot like most teenage boys. There is more than a little of oneself that shows in Talen’s stubbornness, childish presumptions, and lofty views of his own cleverness. That makes the goodness of his family even more profound. Hogan is a stern father with a hint of humor and obviously adores his family. River, Talen’s sister, is an industrious and quick-witted girl whom everyone looks to as a problem solver. Talen’s bull of a brother, Ke, is already an accomplished warrior of great strength like their Da. Talen’s best friend and cousin, the loyal but sheltered Nettle, is also present at the farm. The quiet of Talen’s life is shattered one day while running a simple errand. Talen’s people are a conquered race that live in tentative civility with its conquerors (perhaps somewhat similar to Native Americans in the first half of the 20th Century). While on errand, Talen is chased down by the roused townsmen and officials from a nearby town and savagely beaten before the Bailiff intervenes. It seems that some of Talen’s people (his race) were found to be practicing sleth (unauthorized users of magic only allowed to superior religious-like leaders) and that the children of the sleth, called hatchlings, had fled into the surrounding forest. All of Talen’s race are considered complicit in the offense, and possible harborers of the hatchlings, by towns-folk and tensions are running high. After the beating Talen decides to honor his family and race by doing what he can to track down the hatchlings. The magic system in “Servant of a Dark God,” is interestingly complicated and purposely left obscured by the author. It is revealed to the reader that most of the magic is based on Fire and Soul and Earth, though Fire is by far the most used and explained. A man’s Fire is the energy contained in his remaining days. When one is able to channel Fire, he is also burning off hours, days, or weeks of his life. The effect is called multiplying, which simply means present physical attributes are enhanced by the amount of Fire one can channel. Fire can be woven into items so a normally mundane user can take advantage of the Fire taken from another. An elite class of fighters called Dreadmen use such Weaves to become super-soldiers. “Servant of a Dark God” continues it pitch-perfect pacing to the very end. The reader is left unaware of much, but other things are revealed along the way in natural course. Many times the reader and Talen share in discoveries which strengthens the reader-protagonist bond. What is partially revealed is a world mired in a pyramidal caste system based on tribute and withheld knowledge. Near the top of the pyramid are Masters that are allowed to practice the outlawed magic that they claim is granted only to them by the Creators. There is a hidden group that calls itself The Grove that fights counter to the established hierarchy. This group is reminiscent of druid-like fantasy elements. The Grove’s first goal is to preserve itself, but it also works to uncover the lost knowledge and magic that they know was once shared by everyone. They are waiting in the shadows, hidden amongst the people, keeping watch for the chance to move against the oppressors, or flee and re-group if necessary. Everything is not as it should be to Talen after his beating. His family is acting strange and seems not to take the hatchling escape or hunt seriously. Worse yet, Talen finds small clues that he believes point to the hatchlings being near by, but his family remains incredulous. Tensions are boiling over and there is a shadow of secrecy dogging Talen’s every step. Does he know who he can trust? Is his very family putting him at danger? The reader along with Talen learns little by little more about the larger world. Regions fight regions and each level pays tribute to the station above them. But what is it all for? If authority is deferred ascending to the top, then whose orders do those at the top follow? 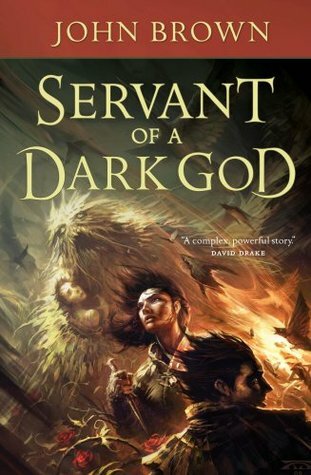 “Servant of a Dark God” does not answer all of these questions, but the book works well enough as a self-contained novel. The reader, once done with the satisfying ending, is left to wonder about what was not disclosed. And on re-appraising the information given, one wonders, did the author plant some red herrings? John Brown’s debut, and the first in a new series, is a blend of both classic fantasy tropes and more modern themes. With its unassuming boy hero it might be easy to write this off as a return to the farm hands and kitchen help of fantasy’s yesteryear but Brown, through delicate crafting of his world manages to avoid this potential pitfall creating something that, while it hearkens back the roots of classic fantasy, manages to become something slightly different. The world of Servant of a Dark on John Brown’s debut, and the first in a new series, is a blend of both classic fantasy tropes and more modern themes. With its unassuming boy hero it might be easy to write this off as a return to the farm hands and kitchen help of fantasy’s yesteryear but Brown, through delicate crafting of his world manages to avoid this potential pitfall creating something that, while it hearkens back the roots of classic fantasy, manages to become something slightly different. The world of Servant of a Dark one is ruled by the mysterious and powerful Divines who ask for and wield the “fire” or life energy of their subjects in order to power their magic. We learn over the course of the novel that the Divines weren’t the only ones in charge and a multitude of conquered people are not necessarily satisfied with their rule. One such people, the Koramites, are a subjugated minority, servants to the powerful Mokkaddians who, in turn, serve the Divines. Tossed into this mix is a magical abomination and the machinations of unknown powers throwing one small corner of this world into near chaos. Read on for more, though some minor spoilers may occur…. If the background of Brown’s world sounds a bit confusion then you’ll likely hit upon one of the novel’s slight weaknesses. The relationships between the various clans and peoples: Koramite, Mokkadian, Shoka, and Fir Noy is never quite clear (excepting the lesser place of Koramites of course) and even the glossary is not always helpful in this regard. Regardless a tenuous grasp of the various interrelationships between clans and people is certainly possible and even that much is enough to spot the tensions between these groups particularly the hatred and distrust the Fir Noy sow with regards to the Koramites. The novel’s other main problem comes with pacing. Part of the trouble here lies with the number of characters who, while all interesting, make for a narrative that is spread rather thin by a desperate juggle of world-building and plot. Save for a few minor stumbles here and there Brown manages to pull this off quite nicely and, while the plot certain stalls in some sections, such as Argoth’s encounter with the Divine skir master which, while interesting, did little to serve the novel’s main conflict (at least initially), there is always something interesting and exciting going on. Then again despite a large number of character viewpoints to follow along with each manages to create a sympathetic and well-drawn character. The sections from the monster Hunger’s point of view I found particularly enjoyable and it was great to get inside a villain’s, even if he was something of a henchman, head. Brown’s attention to character is the, in my opinion, the novel’s strongest quality. I mean the novel begins with a character, Talen, sitting sans pants calmly eating breakfast and waiting to enact revenge on the siblings who he believes stole his pants which is followed by a bit of madcap scene that reveals, with excitement, humor, and action precisely the kind of relationship this family has. That, as far as I’m concerned, is some excellent storytelling. While the split perspectives mean we never have a clear protagonist Talen, I think comes closest to the role of traditional fantasy hero. We learn early on that the way in which Talen perceives the world is not precisely correct and is even somewhat ignorant. While the reader comes around rather quickly to another way of thinking Talen’s glacial move towards that same point of view, while frustrating, is wholly believable. Disclaimer: I received this book via the Library Thing Early Reviewers program. John Brown's Servant of a Dark God is a debut fantasy novel that spoils some of its very good elements with some frankly clumsy mistakes and misccues. The fantasy world Brown posits a hierarchy of magical beings of which mankind sits at the bottom (although there are Gnostic hints this was once not the case) Magical power and talent is tightly and strictly controlled, and those who dare to use such magic are accused of Disclaimer: I received this book via the Library Thing Early Reviewers program. The fantasy world Brown posits a hierarchy of magical beings of which mankind sits at the bottom (although there are Gnostic hints this was once not the case) Magical power and talent is tightly and strictly controlled, and those who dare to use such magic are accused of "Slethery", that is to say, witchcraft. And yet there are those who practice and cultivate such arts in secret, both human and inhuman. Servant of a Dark God focuses on a family in a land recently conquered by overseas invaders, and the dynamics of the rights of the overlord conquerors versus the native population adds to the complexity and depth of the world Brown has created. Characters have confused, divided and conflicting loyalties that shows a depth that many writers with far more experience than Brown never learn or bother to give to their characters and worlds. The magic and arcane aspects of the universe are a bit of a "jump in the deep end", but Brown's ideas are fresh and relatively unique and I liked learning more and more about how it actually worked. Also, unlike the usual epic fantasy, this novel stays within and provides detail for a relatively narrow geographic area. There was no 1000 mile walks across the countryside. This is a local story, which is a nice change of pace from the usual novels of this type. I would have highly enjoyed this novel, with all of these interesting elements, except for two major missteps. First of all, the main character, Talen, was not one drawn well enough to be engaging and interesting enough for my taste. Brown manages to characterize and develop the secondary characters in a much better fashion than Talen, but since this is Talen's story, he gets the lion's share of the action and story. Worse, his story takes far too long to develop. It was a rough slog in the first third of the book, when one of the major mysteries of the novel was who stole Talen's work pants. I stuck it out, and matters improved, but my taste for Talen as a character was permanently ruined by a very weak opening. Second, Brown is a little too complex and clever for his own good. The obfuscation in the novel can be thick and heavy, and while any writer must balance infodump with telling the reader nothing, I think Brown withheld too much information at certain points, to the determent of the narrative. While puzzling out some of this was a positive to reading the novel, in some cases, it only served as a millstone to the reader. This book very nearly failed the "100 page test." By contrast, the last 100 pages of the novel were very good. Hum. Hrm. Where to start? I enjoyed Servant of a Dark God, for the most part. In general, books I enjoy get 3 stars as a baseline rating, to be modified in full- or half-star increments depending on my feelings toward the book. Overall, John Brown's debut novel did enough right to avoid a 2.5-star rating, but not enough to earn 3.5 stars. What did it do right? First off, there's an interesting magic system. Essentially, the consumption of life-force as a kind of magical power source. Not a brand Hum. Hrm. Where to start? I enjoyed Servant of a Dark God, for the most part. In general, books I enjoy get 3 stars as a baseline rating, to be modified in full- or half-star increments depending on my feelings toward the book. Overall, John Brown's debut novel did enough right to avoid a 2.5-star rating, but not enough to earn 3.5 stars. What did it do right? First off, there's an interesting magic system. Essentially, the consumption of life-force as a kind of magical power source. Not a brand new concept by any means, but it's handled well, and it's a nice change of pace from generic fantasy magic. The social setting is also interesting, with clans of varying social status, and further clans out on the periphery; not to mention the true rulers back across the ocean—the book taking place on what is essentially colonial territory. There's a nice mix of introspection and action. And a surprise twist near the end that casts earlier events in a new light. What did it do not-so-right? The big problem here, I think, is the protagonist, the young boy Talen. The world John Brown has devised needs an "innocent" main character to bring the reader in, a character whose role is to be as perplexed as the reader when confronted with mysteries outside his own knowledge of the world. And indeed, a child is often the best vehicle for this. But it's also become such a cliche that readers like myself practically groan aloud when we open a book, only to discover that "oh look, another young boy who'll mature into his special destiny and save the world/defeat the wizard etc." That's one strike against the book already, but sometimes an author can totally pull it off (see last year's ER book, The Warded Man by Peter V. Brett.) Talen actually compounds the child-as-protagonist problem by being totally unrelatable, and a complete jerk to boot. That's not to say that's he's mean by nature; he's justified in his thinking by his own worldview. But the reader begins to catch on to things long before Talen does, and thus finds himself in the awkward position of rooting against the protagonist. By contrast, chapters told from the perspective of adult characters "in the know" I personally found to be far more enjoyable. Another issue I had with the book was the aforementioned plot twist. Yes, it's interesting, but it also comes very much out of left field, as does the book's Big Bad Guy. At the very least, some foreshadowing would have been nice. Finally, it is a very, very bleak book. Yes, happy ending and all that, and relatively bloodless, but husbands are killed, wives are tortured, children and families devoured. A lot of my favorite authors love putting their characters through the proverbial wringer (Donaldson and Erikson, I'm looking at you) but it seems so much more merciless (and merely plot-servicing) here. I purposely left three books, Servant of a Dark God, Warbreaker, and The Undaunted, until the end of my reading for the Whitney Awards, and not because I wanted to reward myself with good books at the end. These were all big, huge books, and two of them, Servant of a Dark God and Warbreaker, are science fiction (and not just science fiction, but the Tolkien-esque "secondary creation" kind of science fiction that I avoid with all costs). So as I write this review, keep in mind that I was stepping way, way out of my comfort zone to read this book. It's something I never would have picked up if not for this contest, even though it was quite a coup for Brown to snag a contract from Tor, the premier sci-fi publisher, with his first novel. I never read fantasy. This is the first Tor published book I've ever read. I've picked up a few recommended by fantasy loving friends but was never able to get through them. After hearing author John Brown speak and visiting with him at the signing table, I purchased his book determined to get through it if it killed me. Well, I wondered at times about the strange names and references to odd things completely foreign to reality. However, I carried on and by the time I finished it, I was thinking I never read fantasy. This is the first Tor published book I've ever read. I've picked up a few recommended by fantasy loving friends but was never able to get through them. After hearing author John Brown speak and visiting with him at the signing table, I purchased his book determined to get through it if it killed me. Well, I wondered at times about the strange names and references to odd things completely foreign to reality. However, I carried on and by the time I finished it, I was thinking in this new language. Wondering what might be eating MY soul. (Do I perhaps blog just a tad too much?) Thinking about the fire each person has inside him. Telling my husband in conversation, "Well, you know, the weave of their spirits." HUH? Oh, you just have to read the book. I probably would have gone with 3 1/2 stars if I could have. The premise is great, and the world was interesting. Some parts were beautifully written, others a big ragged and needed polishing. I felt like a lot of the magic and world building was hastily thrown in, with the reader having to figure out more than we should--but then other parts dragged, especially the end. (It's odd when you find yourself skimming what's supposed to be a climactic battle scene.) Overall, it's a pretty good book, b I probably would have gone with 3 1/2 stars if I could have. The premise is great, and the world was interesting. Some parts were beautifully written, others a big ragged and needed polishing. I felt like a lot of the magic and world building was hastily thrown in, with the reader having to figure out more than we should--but then other parts dragged, especially the end. (It's odd when you find yourself skimming what's supposed to be a climactic battle scene.) Overall, it's a pretty good book, but I expected a bit more from Tor. The novel’s events take place in a world where the use of magic is strictly controlled by powerful magic wielders know as Divines. A rebel group, the Order, is secretly growing their organization in the hope they will one day overthrow the Divines. When one of the rebels is exposed, Talen, a young farm boy, finds himself caught in the middle of the ensuing conflict. The novel does not have a single protagonist, nor does it have a single point of view. The main character is Talen, the son of a prosperous farmer. He is a well-written, but sometimes irritating character who steadfastly stays true to his beliefs. I didn’t always like his thoughts or actions, but they were realistic and believable actions for him to take. The reader also spends a good bit of the book in other characters’ POV’s--for most part those of Talen’s friends and family. I will not go through all of them, but will simply say that they were distinct characters with their own interesting story lines. One of my favorite POV’s was that of Hunger, a dreadful, powerful monster. Good world building is extremely important for me as a reader. Without it I cannot build the willing suspension of disbelief required to become fully engaged in the novel. Having said that, John Brown has done an fabulous job at world building. The magic system is unique and interesting. There are no fireballs or spells of invisibility, instead magic-capable people steal Fire and Soul from others in an effort to multiply their own strength and longevity. The world building also includes a very realistic conflict between foreign overlords and the oppressed locals they have conquered. The cultures are creative and believable, with their own rules and rites. I’m also pleased by the fact that Brown knows his weapons and armor (as well as the tools of everyday living). Nobody tries to “load” a bow (is that longbow magazine fed, or bolt action?) and they draw their bows with a thumb-ring. Small details like these, well-placed, enhance the realism of Servants of a Dark God. For most of the novel I was completely engaged in the story. The process of discovery and the ever-growing threat to the protagonists had me reading the novel as fast as I could. As the novel reached its climax there were two elements that pulled me out of the story. One was the non-stop series of disasters that befell the protagonists. It was relentlessly grim--to the point I believed only a miracle could save the day. The problem is, miracles are really unbelievable. I want the protagonists to save the day. The story got to the point where I didn’t believe they could realistically do it. This left me expecting an unrealistic ending and not fully engaged. The other aspect that pulled me out was the incredible power some of the magic wielding humans and creatures possessed. Anyone on the next “level” above you in the hierarchy of magical power was completely out of your league. You had absolutely no hope of defeating them. These were not major flaws in the novel, but they did create some space between me and the story. They certainly did not slow the pace of my reading. I had the novel in my hands every moment I could spare. Recommends it for: Anyone liking a good adventure! I really enjoyed this book! In fact, I felt sad putting it down, and I really didn't want to give it back to the library. Thank you to the library I go to for putting this book on a display by the checkout counter where you come in - I never would have discovered it otherwise! It had a slow beginning. In fact, I felt that the story really didn't begin until Chapter 3. That's where I got sucked in! Plus, while Talen, Nettle and some of the other characters appear well defined and developed, I fel I really enjoyed this book! In fact, I felt sad putting it down, and I really didn't want to give it back to the library. Thank you to the library I go to for putting this book on a display by the checkout counter where you come in - I never would have discovered it otherwise! It had a slow beginning. In fact, I felt that the story really didn't begin until Chapter 3. That's where I got sucked in! Plus, while Talen, Nettle and some of the other characters appear well defined and developed, I felt that River and Ke were lacking, even with the first two chapters. I was going to mark this book down a star for all of this, however, I realized how well it went to putting you in Talen's head - you know his siblings as well as he does, and as he finds out, he doesn't know them as well as he thought he did. I must admit that River did begin to get more fleshed out towards the end of the story, and Ke a little, but it wasn't enough for me. You don't quite really understand or know what motivates them, but it really didn't seem to matter until the end, and that's when Talen truly begins to understand the people he called family. Besides, there's more books in the future for this story, so I have no doubt these characters will definitely be further developed. Brown did very well to make sure readers were never lost. From the map in the front to the glossary of terms in the back - I really liked both - he made sure that, if you felt you needed to know what something was before it was revealed or needed to refresh your memory, you could. He also did an excellent job of putting the reader in Talen's, Sugar's and Hunger's heads. Sugar is a character who could be more defined as far as I'm concerned, but again, this went to the readers knowing the character as well as Talen does - which keeps Talen as the main character. Even though it seems like Talen and Sugar are building towards something, Talen's the one to focus on. The plot - very deep, convoluted and complex! - didn't disappoint this lover of adventure! It wasn't so much that you couldn't follow it, but it was just enough to make you go, "Huh? What the heck is going on?" a couple of points along the way. Now you don't ask this in a bad way, you truly are trying to unravel the truth along with Talen! That's what I really liked about this - even though you were given information, you never really quite knew who was the good guy or the bad guy until the very end. Even then, you're still as unsure as Talen! This is a first novel and to some extent you can tell that. It is overly ambitious or complex in the delving of fantasy that it portends. David Drake has been quoted and he too says it is complex. Perhaps that is where I get lost. In the beginning we see the world through the eyes of a young man not quite a full man (college age perhaps) and he has a view of the world that is slightly different from the view we have of the world by the end of the story. That it changes as we read the book is detr This is a first novel and to some extent you can tell that. It is overly ambitious or complex in the delving of fantasy that it portends. David Drake has been quoted and he too says it is complex. Perhaps that is where I get lost. In the beginning we see the world through the eyes of a young man not quite a full man (college age perhaps) and he has a view of the world that is slightly different from the view we have of the world by the end of the story. That it changes as we read the book is detrimental to the tale. We do not know up from down because of it. Not only do we not know up from down, the author is doing his best to be unique but as I read this I felt their was similarity to David Farland's Rune series. Brown, the author, cites Farland as a reference, so some of the fantastical elements make sense in that regard. Other's do not. Using the map, long journeys can be done in hours. Communities are designed to support each other in the tale, but they have no reason by terrain or distance to do so. Racism is prevalent throughout, but with such animosity, it is the ante-bellum south and our hero who should know from lynching has a mouth on him. Too many things are out of place to suspend my disbelief that a good work suffers from it. Where we might have been better led was a tale of a young man coming of age in this world, that was defined for us from the start. Not something we had to grow into a definition of. A world where the play of time is not rushed into three days or even a world that does not resort to a flashback of one day for events that have happened previous to the pacing the hero establishes. A world where the henchmen contribute something instead of waiting for the device of soul supported dreadmen and divines who can blow air and kill regular mortals. The story is set in a somewhat prototypical feudal society, complete with ethnic friction and the typical forward-thinking (read human-rights minded) individuals and the seemingly ever-prejudiced, narrow-minded aristocracy. As per usual, the story is told from the point of view of a seemingly normal youth from a farm far enough out of town that nobody notices that his father is a little odd, and, as they always do, circumstances combine to force this hapless youth to contend with powers seemingl The story is set in a somewhat prototypical feudal society, complete with ethnic friction and the typical forward-thinking (read human-rights minded) individuals and the seemingly ever-prejudiced, narrow-minded aristocracy. As per usual, the story is told from the point of view of a seemingly normal youth from a farm far enough out of town that nobody notices that his father is a little odd, and, as they always do, circumstances combine to force this hapless youth to contend with powers seemingly unconquerable. Along the way, he is forced to examine the validity of most of the socio-religious tenets he has believed all his life. He does this while making choices that seem to contradict what he has ben taught, but, as they always do, they feel right despite their conflict with the lessons of his upbringing. The story's plot is not original, but the characters are well portrayed. Their struggles are easy to relate to, and their choices are validated by what the author has told you about them throughout the novel. The book is engaging, pulling you along without losing focus. The story has enough loss to be compelling, and enough compassion to be touching. It is well written, with good flow that ratchets up the tension as the book progresses. Toward the end, the villains become almost god-like, and and the climax, while resolved, leaves enough doubt for a clear flow into the next novels in the series. While the continuation of the plot is clearly necessary, the relevance of the main character in future plots is not so solid, and may feel contrived. The beginnings of a new epic fantasy series by John Brown. I've wanted to read this for some time after seeing favorable reviews and just now have finally gotten around to it. There was an interesting magic system that follows a very specific set of rules. Think Brandon Sanderson style. I much prefer this type of system to the more traditional hand-waving as it reinforces that actions have consequences and some interesting decisions usually arise as a result. The action is con The beginnings of a new epic fantasy series by John Brown. I've wanted to read this for some time after seeing favorable reviews and just now have finally gotten around to it. The action is confined to a relatively small geographical area. Sometimes in epic fantasy there is a bit of informational overload as you try to determine where things are in relation to eachother. By keeping the first installment of the series local you avoid some of that confusion. There were a number of well drawn an interesting characters that made this a pleasure to read. The was really a single element to me: Talen. As the main character in the story, Brown uses the initially oblivious Talen as a device to explain the magic of the world. However, the main problem I have is that Talen just wasn't very likable. I understand some of the reasons, as his obstinateness drives some of the tension of the story, but it is difficult to read a story with such a main character. By the end he comes around, but it can make for some awkward and sometimes infuriating reading along the way. Thoroughly engaging and fascinating book, with some fresh, original takes on the fantasy genre--especially if you're NOT Mormon. Brown, being LDS, has infused a great deal of LDS doctrine into the book's world, which makes for some pretty fascinating reading for those not familiar with it, and some comfortable reading for those who are. As a Mormon, I enjoyed how he used those points of doctrine and incorporated them into the story. 1. Thoroughly engaging and fascinating book, with some fresh, original takes on the fantasy genre--especially if you're NOT Mormon. Brown, being LDS, has infused a great deal of LDS doctrine into the book's world, which makes for some pretty fascinating reading for those not familiar with it, and some comfortable reading for those who are. As a Mormon, I enjoyed how he used those points of doctrine and incorporated them into the story. 2. I didn't love it enough that I'd want to buy it or read it again. A book has to be REALLY special to fall into that file. It's very good--don't get me wrong. But not THAT good. 3. No discredit to the author, the editing was horrid. Tor's editing wing missed dozens of typos--including some that can't be explained away by over-reliance on spell/grammar check. That may not be a big deal for most readers. For me it was a deal breaker--a distraction to a writer and editor who goes to great pains to eliminate those in her own work. It is somewhat disheartening to realize that a publishing house might not be as concerned as the authors who trust them with their literary children. Th Servant of a Dark God is John Brown's debut novel. At the end of the novel, I felt very similar to when I read Sanderson's first Mistborn novel. I think this series could go somewhere awesome- but it's going to depend on Brown. The system of magic took me awhile to grasp, as well as the political situation. I think that's my biggest issue with the story. Even after reading, I'm not entirely sure I understand everything, though most things have been cleared up. The main character could have been more compelling, but the "villain" of the story is definitely one of the better ones out there. Hunger is like an alien forced to add humanity to his viewpoint- it adds to his character a great deal. Recommended to anyone who likes epic fantasy. The uniqueness of Brown's ideas will hold you- it's not the quest-based usual. Four stars. Unique: The nature of the world is quite different from standard epic fantasy with a very dark history. Discovering a new and unique world is part of the fun of this genre. Another Superman Farmer: Can't the savior of humanity be from a city? The bad guys: none of them are that interesting -- there are a bunch of thugs and a few immensely powerful evil doers, but they are about as interesting as a 500 pound leach. I enjoyed parts of the novel and may read the next book of the series, but I'm not "dying to find out what happens". After a slow start and somewhat initially repellent characters this story found its legs. It was rendered in somewhat unsophisticated (but at least unobtrusive) prosody but the dialogue left much to be desired. It veered between the cliched faux-archaisms that plague the genre and too contemporaneous modes of speech (which ironically will soon be literally anachronistic making the unfortunate faux-archaic stand out even more). Most disruptive of all was the grab-bag appropriation of Mormonism's After a slow start and somewhat initially repellent characters this story found its legs. It was rendered in somewhat unsophisticated (but at least unobtrusive) prosody but the dialogue left much to be desired. It veered between the cliched faux-archaisms that plague the genre and too contemporaneous modes of speech (which ironically will soon be literally anachronistic making the unfortunate faux-archaic stand out even more). Most disruptive of all was the grab-bag appropriation of Mormonism's phrasings and idioms which I hope, coming from an author of San Pete county were unintentional but I fear were heavy-handedly intentional. This one is to be read almost entirely for the storytelling, which improves throughout but those coming to it with higher expectations may be somewhat disappointed. I thought this was an alright start to a series. It appeared at times that Brown was a little over eager as a writer and made the story almost too complex for the casual reader to enjoy. I had a lot of trouble following the story after I would put the book down because it was just too complex. I didn't understand the magic or what was going on. Sometimes the writing did seem a bit choppy and short but other then those two problems it was a good first book. But I did enjoy some of the characters I thought this was an alright start to a series. It appeared at times that Brown was a little over eager as a writer and made the story almost too complex for the casual reader to enjoy. A great first book. I think the world this author created is very unique. I loved the slow build of plot. I was not told what was happening, I discovered it. The story was told from many different characters, but it was obvious that Talen would be the hero of this story. I loved the viewpoint of the monster, Hunger, and his inner struggle with who he had been and what he is now. I was satisfied with the conclusion and look forward to a continuation of this story if there is one. This book took a while to get into, but it has an interesting story. While the book deals with magic, which is very popular these days, it does so in a unique way unlike any book I have read so far. Magic protects the people, but is also considered evil if people other than those in charge possess it. The story is about the development of a boy who must battle between what he told was right and wrong and what he truely believes is right and wrong. I feel like I ought to have liked this book more than I actually did. Relatively original take on religion-vs-magic in a fantasy setting. Hints at a larger world beyond the scope of the book. I just don't think I read any more books with naive farmhand manboys with secret power as main characters...blah. Really well done and quite imaginative, took me a couple of chapters to get the names and allegiances down, but after that it was gripping to the point that I really didn't want to put it down. Talen's constant anger was pretty annoying, but that is how a teenage boy would likely act too, so well done. Excellent first novel. Incredibly intense. Brown writes action scenes very well -- in fact, better than even some of the top tier fantasy authors. He needs to work a bit on characterization and sleekness, but on the whole a very enjoyable, compelling classic fantasy novel (but with enough unique twists to the plot and world building as to not seem derivative). It is very descriptive and the story is moving along easily. But did they have to kill the dogs? john brown is definitely and author to look out for he has such a vivid imagination and his story telling ability is pitch perfect. I thoroughly recommend this book to anyone. Interesting world, characters, and story, though I've seen some better. It's a great read considering it's only a debut novel. Magic system was teased out throughout the whole book and even at the end we're still in the dark about most of it. The upcoming books will be things to look out for.